So, the 4th week of extension building works is behind us and for the first time I was actually getting anxious for our extension 'project' to finish once and for all. The excitement has worn off and all the dust and noise is starting to get to me. I still don't regret living here whilst carrying out the building works, but when you have a toddler it does make everyday life more challenging. Especially, when you have limited access to the kitchen. Don't get me wrong, my builders have been great and made sure that there are as little interruptions as possible. However, it's all part of the job when you build an extension. 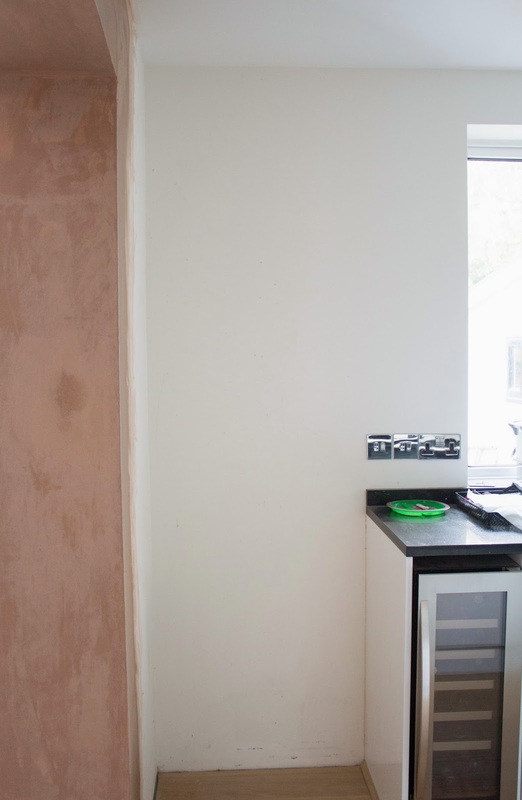 On week 4, we had our plasterer over to make sure the walls were perfectly even and ready for the paint job. There were some pretty strong fumes coming from the extension so I spent most of the time in the living room or upstairs to avoid breathing them. There is still quite a bit of work that needs to be done, especially around the kitchen opening. Also, I never realised how long it takes plaster to dry. It takes several days for the new plaster to dry indoors and even longer for outside areas. 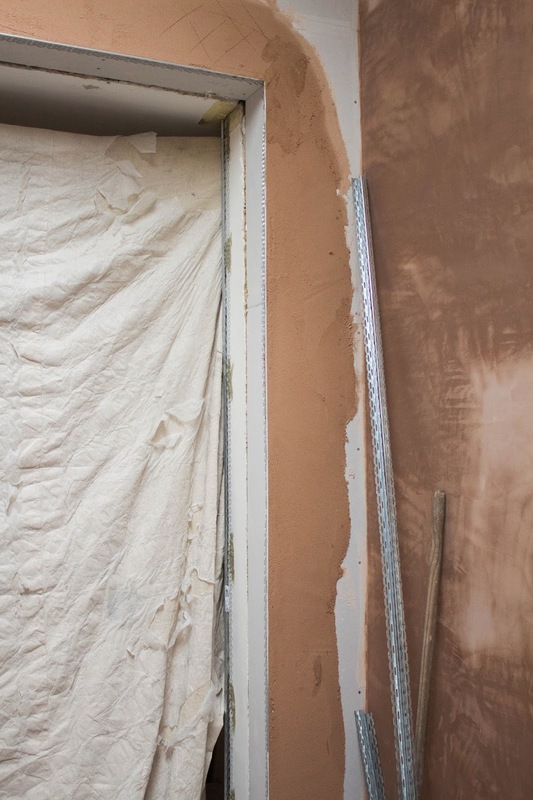 If you paint over plastered walls too soon you might get some cracking which is why it's important you let the plaster dry out naturally (no humidifiers!). It was interesting to see how the builders used steel reinforcements to make sure all the corners are straight (see picture below). What a clever idea! I know this will be the only 'perfect' room in our house. No sloping floor and wonky walls or door frames. My builders told me that they have been asked to make new builds "imperfect" so that it will have some character. I find this idea crazy but I guess it means that our house has more character than any other house I have ever lived in! It's all looking a lot neater here than last week and I cannot wait to have our fridge back to it's place (hopefully undamaged). I am very glad that we decided to go for a free standing fridge rather than a boxed one because otherwise the job for the builders would have been a lot more difficult. I am also pleased that they have been careful and haven't damaged our new kitchen in the process (yet!). I finally ordered our plug sockets which were more tricky to find that I originally thought. We want to use the same Grabtree chrome ones as we have in the rest of the house to keeps things consistent and B&Q have stopped stocking them for some reason. Luckily, I found an online supplier who still sells them so problem solved. By the way, I love polished chrome. Yes it does show finger prints but it looks very timeless and the shiny surface bounces light off beautifully. I associate brushed chrome with office interiors and it just doesn't have the same wow factor for me. However, our spotlights are brushed chrome and you really don't notice them too much. I don't think it's a big deal mixing brushed chrome and polished chrome but I wouldn't try to mix them with nickel. This week I also had to order the spotlights for the room. Due to the sloping roof, I thought that adjustable ones will work better than fixed spots. I ordered 7 spots altogether (3 on each side plus one in the middle next to the double doors). You really don't want to get too many spotlights as otherwise the room can end up looking like an airport landing! I don't plan to use strong lighting in the room which is why I opted for dimmers. I find that floor lamps and table lamps give a lot nicer ambiance than ceiling light. I do wonder if we should have installed wall lamps but they do restrict the furniture arrangement which is why I decided against them. Unfortunately, our lights won't arrive until in a few weeks time which means our builders will need to be back to install them. 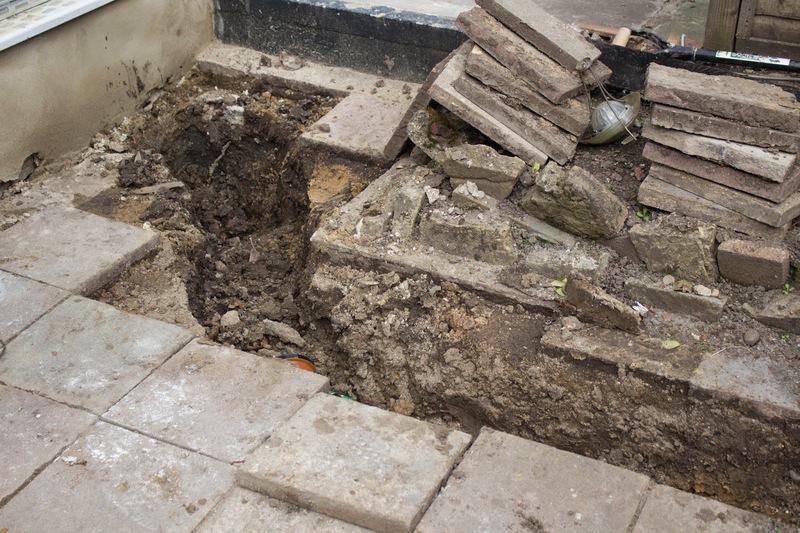 Our builders had to also install drainage in our garden which we didn't previously have. When I saw them digging a hole in the grass I nearly had a heart attack! 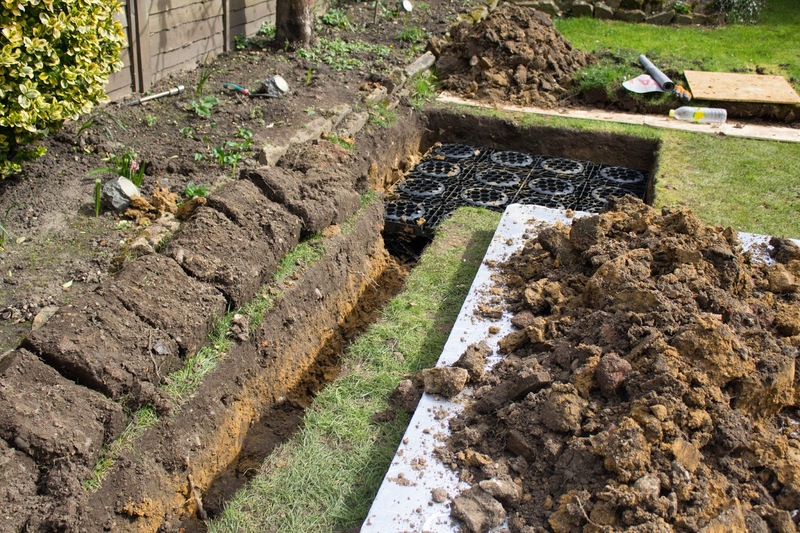 I knew they had to put in drainage due to current building regulations but I had no idea how they will actually go about doing it. Obviously, they covered it up but I am a little concerned how our grass (which is not great to begin with) will settle back to the level it used to be. The ground is slightly higher now than where it used to be. Our builders also connected the new radiator to our existing heating system. 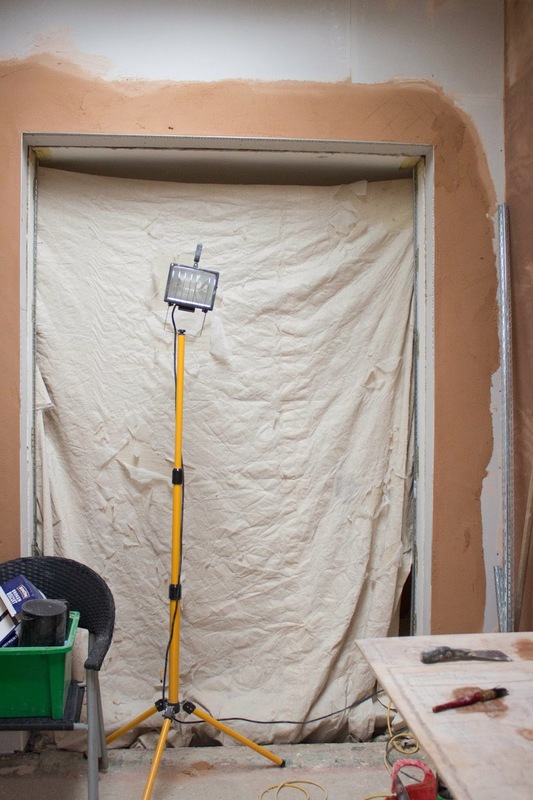 I am so glad that these guys do pretty much everything themselves (building, plumbing, electrics, plastering) because if there's one thing I have learned from our past renovation projects is that you want the same people to do the job from start to finish. Also, I personally don't like builders who use other suppliers for the job as it's a lot more difficult to track the quality of work they do and whether they are reliable in the first place. That's it for week 4! Not long to go now and I am looking forward to start thinking about furniture, patterns, colours and accessories for the room. That's really the fun part isn't it? !